We have heard many say that “We exist under an illusion of separation” but what this means and why it occurs varies depending upon the source. There are also discussions of the ending of this separation and this is also defined through varying perspectives. I too have a perspective and would like to share what I see and how it connects. Take what is useful… leave what is not. If you have been reading my posts you know that consciousness is comprised of photons that contain the energy of experience. Photons have a natural tendency to ‘adhere’ that has has been observed by scientists studying quantum mechanics. The dynamics change somewhat when you are discussing toroidal rotations of self-aware assemblies of photons, but the concept is the same. For ease of understanding let’s assume that every person incarnated on the planet at this time is an individual computer hard drive (a very literal interpretation). This is the expected state of third density consciousness: existence as separated spheres of consciousness. 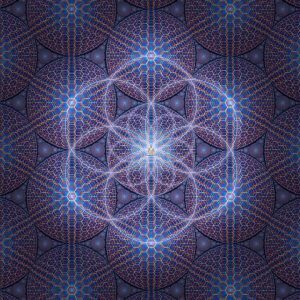 Collectivity cannot be achieved in third density because each individual is working to balance their consciousness. Achieving balance is a prerequisite of collectivity. An imbalanced collective would wobble into self destruction and in the interest of preserving consciousness, will not be allowed. Because of this we have all been walking around with our hard drives separated like it is the 1970’s because we did not have the energy or balance to connect. “We were existing in separation”… until now. Some believe that nefarious entities have worked to impede our progress, but if you dig deeper the ultimate impediment has been the creation of polarity and all of the mutations it caused in consciousness. With the eradication of this creation, consciousness on Earth with the proper density has been moving forward at increasing speeds toward collectivity. Our individual hard drives are beginning to connect to the cosmic internet that we call “collective consciousness”. Consciousness consists of photons of energy, and that energy represents knowledge and experience. As separate components, this knowledge is only available to the body the consciousness is attached to. As consciousness continues to rise in density and energy it expands. As it expands it naturally begins to seek ‘photonic adhesions’ when it acquires the energy to do so. These adhesions require a sympathetic resonant action between all of the consciousnesses attempting to connect, or in the currently accepted vernacular; “Matching your frequency and vibration to the feelings of love”. As the ascending consciousnesses embrace this concept they balance themselves and begin the energetic connections of collectivity. A collective consciousness shares the energy of experience and knowledge throughout the entire connected collective. Billions of individual consciousnesses, an incalculable number of lifetimes worth of experience, all shared. This is the power of the collective, and yet just one small aspect of that power. The manifestation of this collective connection is what we are starting to witness now. In a previous post I discussed the three groups that most articles fall into. I am going to omit the cataclysm group because I really don’t think that anyone subscribing to that viewpoint would be reading anything I publish, and rightly so because it does not apply to them. However, if you look at enough publications from the hope and ascension groups you begin to see curious synchronicities. It is almost as if everyone is getting similar information and providing it using their personal perspectives… and that is exactly what is happening. The ascending collective is solidifying and we are working through our perceived separations. The first step to collectivity is dissolving the ego construct and one of the steps along that path is to let go of societies Separation Equation. If you are clinging to any factor in this equation, you still have some work to do. A collective operates for the ascension and fulfillment of the whole and that is what we see when we look deeply into the vast array of awakening messages. I am watching all of this occur within our rising collective and it fills me with joy because I am so tired of this game. Can you look around and still see a huge amount of separation being pushed upon the masses? Of course you can. However, you should know that those embracing this frequency are right where they are supposed to be and they will continue to learn their lessons long after the deflection of the collective has occurred. They will awaken when they have the capacity to do so and there is no judgement in this; you may choose whatever experience you want. The critical factor here is the unseen push in your consciousness that steers you away from separation and toward unity. That is called BALANCE and it is the objective of third density. When you achieve it, you graduate and move on. Some of my posts might sound a bit cryptic but I have to watch how much detail I provide or they would turn into a book in and of themselves and you might lose interest. I assure you that if you read my book you will remember that these posts are here and they will help provide the clarity that you then seek.